We are in hot weather again and cold soup can do the trick to add electrolytes and hydration to a meal. Take those spices out of hiding in the cabinet and use them for this soup! Spicy food not your style? Scoville units too high when you see the word jalapeno? This recipe is not too hot to handle with the right spice flow. I wanted to try a soup which could be hot or cold, against a thickened background of potatoes, cauliflower and peas. Spice mixture : ginger, ground coriander, chives and onions and liquefied with some vegetable broth and 1/2 and 1/2 or light cream. Must have ground coriander ( the seeds) AND fresh coriander leaves! Cauliflower is getting a new take on healthy by it’s high Vitamin C content and a free food as a low starchy carb. It possesses Sulforaphane and a sterol, 3-indol carbinol, important in preventing Diabetes 2, Ovarian and Prostate cancers. If lactose intolerant, use plain soy milk or almond milk instead of half and half. 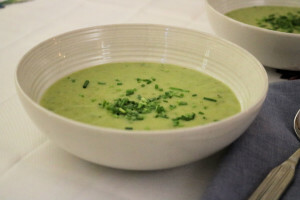 Served cold, keeping it overnight in the fridge, this soup has a minty green hue and all blended together makes it an easy choice for summer. The French, have a cold potato soup with chives called Vichysoisse. This soup, Harva Shorva or Green Soup has been adapted from Madhur Jaffrey’s book, “Indian Cooking”. Combine the cauliflower, stock, chopped onions, ginger, ground coriander and cumin in a pot with water to cover and add a 1/2 tappoon of salt. Bring to a boil and lower heat to simmer for 15 minutes or until the potatoes and cauliflower are soft. Add the peas, fresh coriander, cumin, chopped chili, lemon or lime juice and cook through for an additional 4-5 minutes on medium heat. Remove from heat and let cool for 15 minutes. In a food processor or blender, add all the ingredients in the pot and pulse until pureed, or very smooth.